Blurring the line between fact and fiction, Eduardo Halfon shares family photographs and an annotated excerpt from Mourning in “A Yom Kippur Scene (With Footnotes)” on the Jewish Book Council’s “ProsenPeople” blog. Tune into a terrific conversation between debut novelist Diane DeSanders, author of Hap and Hazard and the End of the World, and Bellevue Literary Press publisher Erika Goldman in the General Society of Mechanics & Tradesmen’s Labor, Literature and Landmark lecture series. Congratulations to our International DUBLIN Literary Award longlisted novel The Attempt and Housatonic Book Award Finalist A Road Unforeseen: Women Fight the Islamic State. Congratulations to Jerome Charyn, whose A Loaded Gun: Emily Dickinson for the 21st Century has been named to the Phi Beta Kappa Christian Gauss Award Short List and the PEN/ Jacqueline Bograd Weld Award for Biography Longlist, and is a Firecracker Award Finalist. 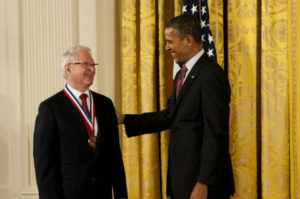 Dr. Vilcek receiving the National Medal of Technology and Innovation in 2013. Bellevue Literary Press board member and research professor at NYU School of Medicine Jan Vilcek holds 46 U.S. patents and is co-inventor of Remicade, an anti-inflammatory drug that has improved the health of millions of people worldwide. In a new addition to his list of accolades, Dr. Vilcek has been selected as a fellow of the National Academy of Inventors, which honors leaders in academic invention whose discoveries have made a significant impact on quality of life. We are immensely grateful to Dr. Vilcek for his service on our board and congratulate him on this latest honor for the extraordinary contributions he has made to the arts and science communities. Congratulations to Bellevue Literary Press board member Jan Vilcek, who has been named a fellow of the National Academy of Inventors, which honors leaders in academic invention whose discoveries have made a significant impact on quality of life. Dr. Vilcek is also the recipient of the National Medal of Technology and Innovation. Congratulations to our PEN/ Jacqueline Bograd Weld Award for Biography longlisted title A Loaded Gun, our Julia Ward Howe Award Finalist Starlight Detectives, and our Firecracker Award Finalists American Meteor and A Solemn Pleasure. Ploughshares shines their “Indie Spotlight” on Bellevue Literary Press, while Publisher and Editorial Director Erika Goldman joins the 1888 Center’s The How The Why podcast to discuss BLP’s unique mission. Tune in to the Late Night Conversation podcast to hear our publisher Erika Goldman discuss being a part of the NYU School of Medicine and the nexus of art and science. President Barack Obama honored Jan Vilcek, MD, PhD with a prestigious National Medal of Technology and Innovation during a White House awards ceremony on February 1. This year eleven individuals received this medal, the highest honor bestowed by the United States government upon scientists, engineers, and inventors. We are deeply grateful to Dr. Vilcek for his service on our board—and for the contributions he has made to the arts and science communities throughout his extraordinary career. Bellevue Literary Press is a finalist for AWP’s Small Press Publisher Award—an annual prize for nonprofit publishers that honors the “publication of consistently excellent work.” Winners will be announced this March at the AWP Annual Conference & Bookfair in Boston. Publisher Erika Goldman talks to City Lights Booksellers & Publishers about what’s exciting her at “this moment in publishing.” Find more insight from fellow independent publishers, including Akashic Books and Feminist Press, in this terrific interview series. The National Endowment for the Arts has announced their 2013 Art Works grants and we’re very proud to be among the literature recipients. Our $10,000 grant will be used to help readers discover and engage with our books through a variety of creative digital initiatives. Thanks to the dedicated staff at Sonnet Media, we now have a place to share all the stories behind the books we publish. Over the coming months, we’ll be adding Q&As with our authors, excerpts from their books, reading group guides, videos, and more. We are also excited to unveil our new logo, which impressed author Jonathan D. Moreno as being an accurate reflection of our belief that literature is indeed life’s laboratory. We hope you’ll visit us often to enjoy our latest concoctions. We can’t wait to get back. UPDATE: We are thrilled to announce, that as of March 29, 2013, we have returned to our offices in Bellevue Hospital.